A year ago, there was not one, but two Linsanities. There was the Linsanity that we all witnessed: that glorious stretch of games when an Asian American point guard from the end of the New York Knicks bench scored, passed, and even dunked like he was possessed by a higher power. Twitter feeds lit up like Times Square; marriage proposals and VaLINtine’s Day cards were thrown at his feet; Lin-spired merchandise flew off the shelves like Lin’s lobs to Tyson Chandler; and horrible Lin puns were churned out nonstop, like "Lin-spired." Even President Barack Obama claimed he knew about his fellow Harvard alum before anyone else did. 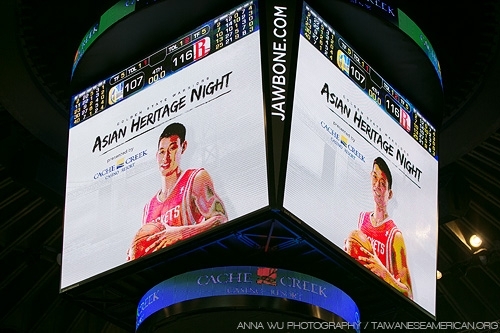 With each heart-stopping drive down the lane, and with each groan-inducing racist utterance from national commentators, there was an overwhelming sense that we, that is the Asian American we, were on the court with Jeremy -- both the basketball court and the court of public opinion. In the span of a month, Jeremy lifted a team, a city, and Asian America. But before Linsanity, there was just Lin: an Asian American basketball phenom from Palo Alto with a dream to play in the NBA, and that was enough for director Evan Jackson Leong and producer Bryan Yang to make a documentary. They started following Jeremy at Harvard. They were there when he went undrafted. They were there when, as a member of the Dallas Mavericks summer league team, he outplayed number one draft pick John Wall. And, they were there when Jeremy signed a dream-come-true contract with his hometown Golden State Warriors. "This would’ve been an interesting story [even] if Linsanity hadn’t happened," said Phil Yu of AngryAsianMan.com, a popular Asian American news/culture blog, on an episode of my web-based talk show, The Joy Dunk Club. And for both the film's main subject and its creators, their persistence and hard-work finally paid off. 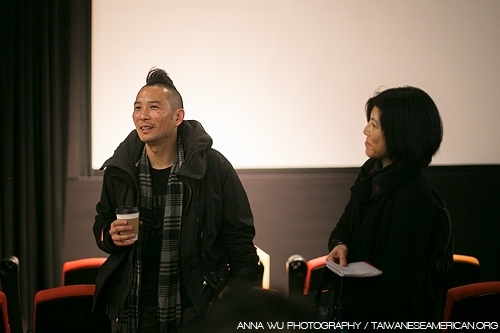 Fresh off its successful world premiere at the prestigous Sundance Film Festival, Linsanity will kick off the Center for Asian American Media's film festival, re-branded CAAMfest, on opening night. 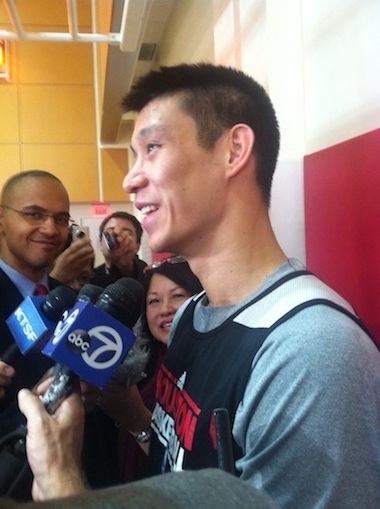 Indeed, home -- its elusive quality and what it offers: stability and recognition -- is a familiar Asian American theme that runs through Linsanity. 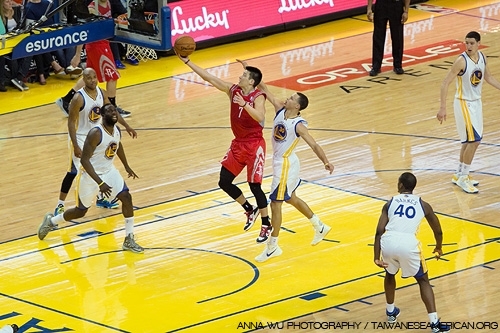 The film follows Lin’s nomadic existence as a professional basketball player, shuttling back and forth between the bright lights of the Bay Area and New York City and minor league outposts like Reno and Erie, Pennsylvania. All the while, Jeremy tries to maintain an optimistic attitude -- we see just how important his Christian faith is in keeping his spirit buoyed -- but, we also see the toll that being benched, cut, and ignored takes on a young man with obvious talent and a strong work-ethic. In the film, we see just how high the odds are and just how low Jeremy has sunk: at times, faced with the sobering reality that his next game may be his last in an NBA uniform. This is why even the most dedicated Lin fans, those who have replayed YouTube clips of his soaring dunk against the Washington Wizards or his purple-stained tongue-wagging against the Utah Jazz or his last-second, game-winning shot against the Toronto Raptors, will enjoy this film and cheer that much harder. But, how was Linsanity for Jeremy Lin? 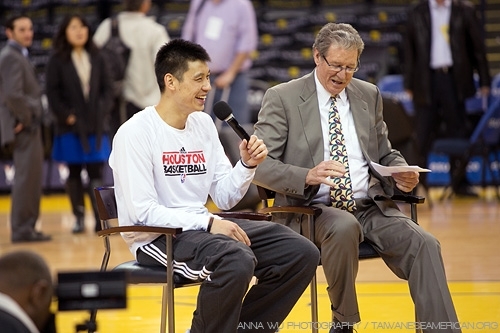 Jeremy Lin at "Asian Heritage Night"
For many in the Bay Area, it, too, was a great memory. Thousands of fans stayed after the game for a Q&A with the point guard, who looked exhausted after leading the Rockets to a 116-107 victory over the Warriors, the team that had originally cut him. The number “8” means good fortune in Chinese. Perhaps the fact that Linsanity is listed at eighty-eight minutes long isn’t a coincidence, given the good fortune now enjoyed by Lin and Linsanity.